There are significant divides between younger Republicans – Millennials born between 1981 and 1996 – and their elders in the GOP on a range of environmental and energy issues. 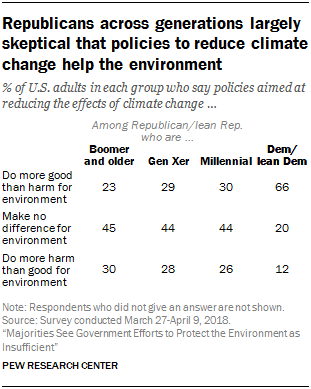 One notable difference is that larger shares of GOP Millennials believe that the Earth is warming mostly due to human activity or say that climate change is affecting their communities. About a third (36%) of Millennials in the GOP say the Earth is warming mostly due to human activity, double the share of Republicans in the Baby Boomer or older generations, according to a Pew Research Center survey. This finding is consistent with a 2017 Pew Research Center survey that used somewhat different question wording. In addition, 45% of Millennial Republicans say they are seeing at least some effects of global climate change in the communities where they live, compared with a third of Republicans in the Baby Boomer or older generations. More Millennial Republicans than those in older generations say the federal government is currently doing too little to protect key aspects of the environment such as animals and their habitats (60% of Millennial vs. 34% of older Republicans), water quality of lakes, rivers and streams (59% vs. 43%) and air quality (49% vs. 29%). And, when it comes to views about energy issues, Millennials are less inclined than older generations in the GOP to support increased use of fossil fuel energy sources such as offshore drilling, coal mining and hydraulic fracturing. For example, 44% of Millennial Republicans support the increased use of offshore drilling, compared with 75% of Republicans in the Baby Boomer and older generations. However, Republicans across all generations are largely in agreement over the consequences of policies aimed at reducing climate change. For example, 44% of Republicans say policies aimed at reducing the effects of climate change make no difference for the environment, and around a quarter believe such policies do more harm than good for the environment. The share of Millennials holding those views differs little from the overall party numbers. 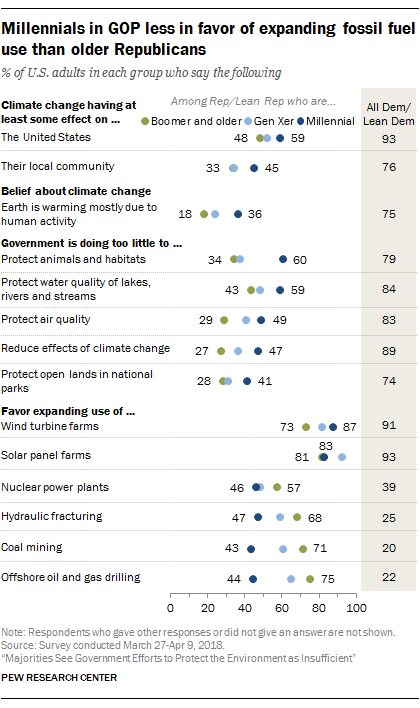 Among Democrats, there are no more than modest differences by generation on beliefs about the climate and energy issues cited in this analysis.